Big Brake Kits give your vehicle that Supercar look and feel, and exceed stock performance in two areas. First, larger rotors increase heat capacity. Second, stiffer calipers and stainless steel lines reduce system compliance. The key, however, is to increase heat capacity and reduce compliance without upsetting the stock front to rear brake torque ratios. If the brake upgrade you select adds too much front torque (as many do), you reduce your car's ability to utilize the tractive capacity of all of the tires to the maximum practical extent (even on ABS equipped cars) and you therefore create performance sacrifices. In addition, too many pistons or pistons that are too large will make the brake pedal much more difficult to modulate, which limits a driver's control of brake input on the race track. Note: Silver, Yellow, Blue and Gold calipers have up to a 30 day lead time. Yellow, Blue and Gold are $200 extra per axle. No extra charge for Red, Black and Silver. 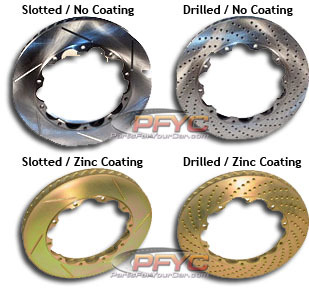 Rotors are available in slotted or drilled and with/without gold zinc coating. Drilled rotors are $100 extra per axle. Gold zinc coating are $70 extra per axle. The anti-corrosion gold zinc coating benefits customers who live in cold climates where snow and road salt are commonly encountered, and customers who would prefer to not have visible surface rust on the vanes and outer circumference of their rotors. Zinc coating does not have a negative environmental impact like other coatings. The calipers in this kit comes with Axxis Ultimate performance brake pads. The performance pads included with kits are suitable for both street and light track use such as Autocross (1 lap at a time). For more aggressive track use or race use, it is very important to select pads appropriate to the type of driving. If you wish to order alternative pads separately please contact us. Most 17' wheels will clear the outer diameter of the caliper for a 332mm kit. For a 355mm kit, a minimum 18' wheel is typically required. The more critical clearance, however, is the gap between the spokes of the wheel and the face of the caliper. Do not assume that a larger-diameter wheel will automatically clear the face of the caliper. StopTech recommends at least 2mm of additional clearance. See the Wheel Fitment Drawing page on the StopTech website for more specific measurements, at www.stoptech.com. Note: Final fitment of the wheel to the caliper is the responsibility of the customer.